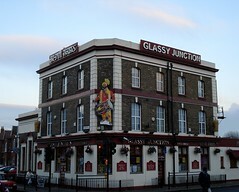 Now closed; was a marvellously gaudy pub in Southall. As of late 2011, London Drinker reported that the freeholder was "believed to be seeking a new tenant", while as of autumn 2012 they further report that the premises are now occupied by a branch of Saravanaa Bhavan. Kake and Ewan visited on a Thursday evening in December 2008. There was no real ale on offer (and indeed no handpumps on the bar), so we settled for a pint of Strongbow and one of Kingfisher, which came to £6.10 in total. They also offer Cobra lager on draught as well as the familiar basics. The main room consists of a carpeted L-shape wrapped around the long bar, with banquette seating running all the way around the exterior walls. There's a large flatscreen at one end, which on our visit was playing music videos (courtesy of Brit Asia TV, I think). Another screen tucked away in a corner was silently showing netball, of all things, in the wrong aspect ratio. To one side is a pool room with at least two tables, which on our visit was heavily patronised by a number of (boisterous, yet not threatening) young Asian men. The decor is bright, glittery, and lavish, all golds and silvers (with additional Christmas tinsel on our, December, visit) photo. The bottom of the bar is covered with mirrors, and the bar staff wear velvet waistcoats with the name of the pub embroidered in gilt on the back. Despite the lack of real ale, we did like it here, and would have stayed for a second pint if it hadn't been so cold - almost everyone in the pub was wearing a coat, and we suspect the heating might have been temporarily broken. Indian food is served all day (noon-10:30pm). Kake's verdict: I'd come back another time, if I happened to be in the area - as far as I know, almost none of the pubs in Southall do real ale, so it's not like we'd easily be able to find more interesting drinks elsewhere. Last visited by Kake and Ewan, 11 December 2008. Opening hours and food times taken from the Time Out website, December 2008. Last edited 2012-11-06 09:53:08 (version 8; diff). List all versions. Page last edited 2012-11-06 09:53:08 (version 8).